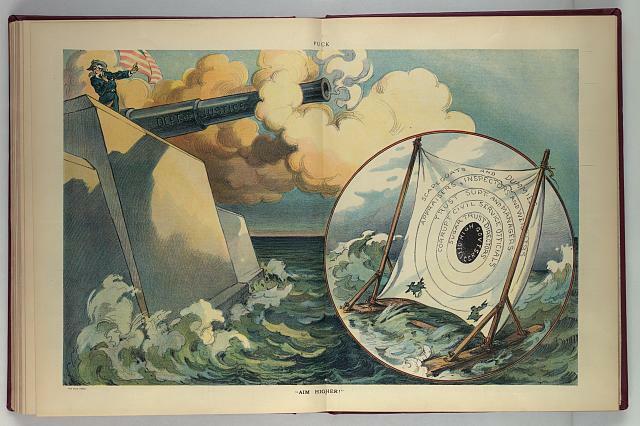 These are from the Library of Congress’s Prints & Photographs Online Catalog. 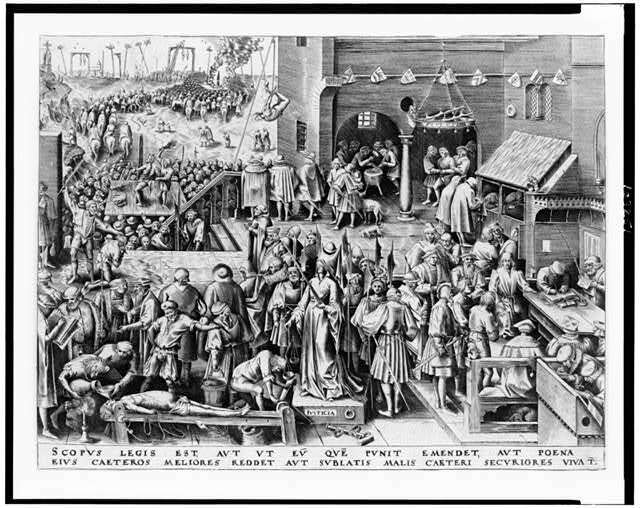 Not much has changed in a hundred years — or, in the case of the Bruegel print at the end of the post — 500 years. The first four images are by Udo Keppler and were published in Puck. I’ve copied the Library of Congress’s summaries for the illustrations. Although the actors may not be familiar to us, their behavior and values seem altogether too familiar. By Udo Keppler. 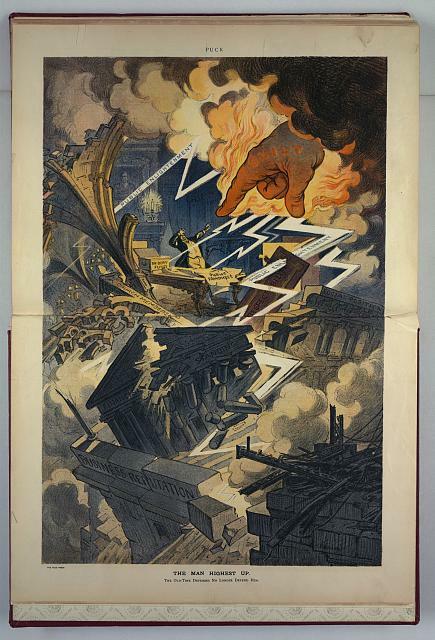 LoC Summary: Illustration shows a large flaming hand labeled “Guilt” emerging from dark clouds pointing to a man’s downfall as the institutions labeled “Business Reputation, Financial Standing, Social Position, Respectability, [and] Church Membership” that he has worked to build up crumble as lightning bolts labeled “Public Enlightenment”, revealing his corrupt practices, strike them. Published in Puck, v. 65, no. 1665 (1909 January 27). By Udo Keppler. 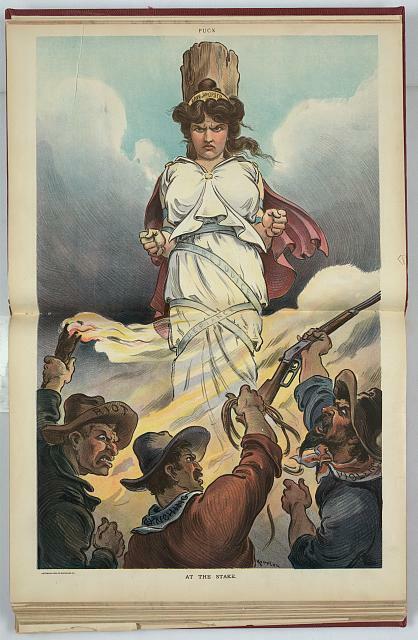 LoC Summary: Illustration shows three men labeled “Riot, Lynching, [and] Violence” burning a female figure labeled “Law and Order” at the stake; she is bound to the stake with ribbons labeled “Prejudice” and “Defiance”. Puck, v. 53, no. 1377 (1903 July 22). By Udo Keppler. 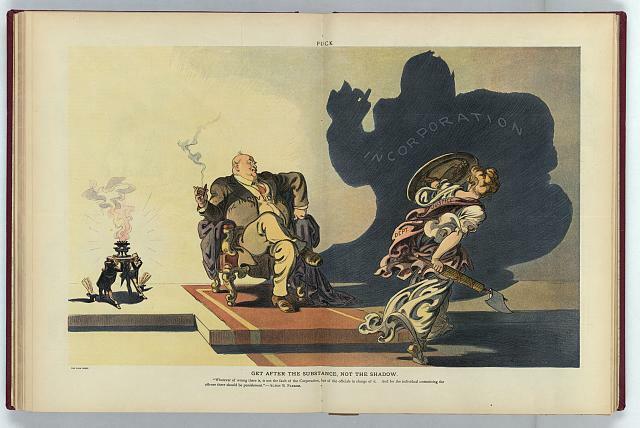 LoC Summary: Illustration shows an oversized man labeled “The Individual” casting a shadow labeled “Incorporation” which is caused by a light, on the left, held by a “Corporation Lawyer” and a “Corporation Legislator”; on the right, a female figure labeled “Dept. of Justice” carrying a shield and a fasces, assails the shadow. By John Scott Clubb. Published 1906. 79 varieties. Depew: If I get out of these by the time I am 72 I will be able to do my real work in the Senate. LoC Summary: Outside the U.S. Senate, New York Senator Chauncey Depew (1834-1928) holds open his topcoat, exposing several layers of coats labeled with various real estate, banking, insurance, railroad, and trust companies. . . . 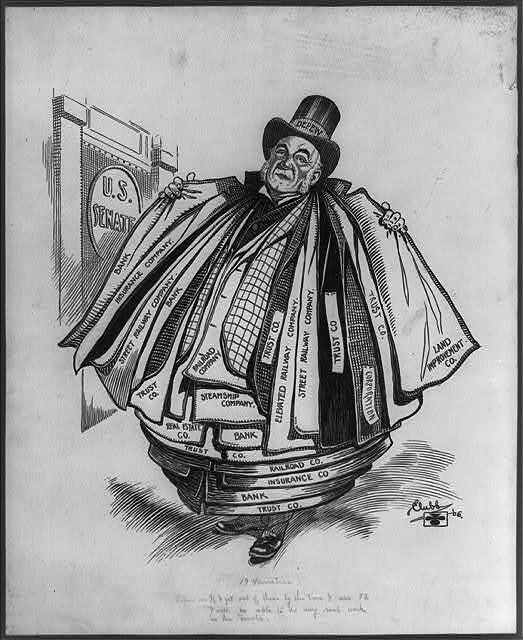 The cartoon relates to a 1905 congressional investigation exposing Depew as a member of the boards of dozens of major corporations while still carrying on his duties as a U.S. Senator. It also revealed that he received sizable retainer fees from many of these companies, transactions viewed as gross conflicts of interest by his critics. By Will Crawford. Watching the tape or watching the wheel – what is the difference morally? 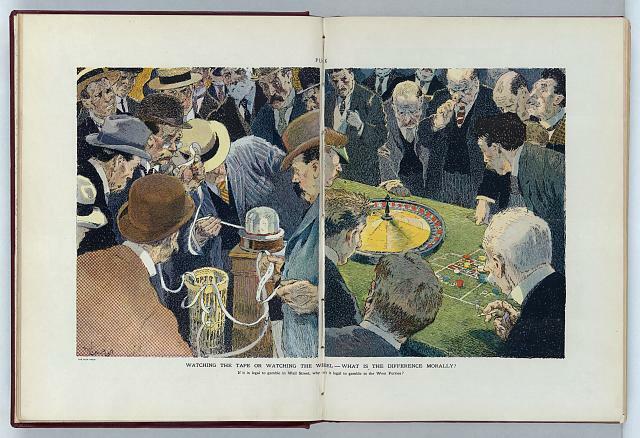 LoC Summary: Illustration shows a two panel cartoon, on the left, anxious businessmen are gathered around a ticker tape machine, reading the ticker tape; and on the right, anxious gamblers are gathered around a roulette wheel, awaiting the outcome. Illus. in: Puck, v. 72, no. 1852 (1912 August 28), centerfold. by Pieter Bruegel (1525-1569). LoC Summary: Justice stands blindfolded as people around her are being tortured. This entry was posted on December 29, 2011 at 9:25 pm	and is filed under Historical, Library of Congress. Tagged: John Scott Clubb, Library of Congress, Prints & Photographs Online Catalog, Puck, Udo Keppler, Will Crawford. You can follow any responses to this entry through the RSS 2.0 feed. Both comments and pings are currently closed.